selecting the one character opcodes? The codes that tell the machine what to do next (the "Op-Codes) are almost always in Octal or Hex. If you don't know what these are, consider yourself one of the unwashed - and go back to the cave or bar. The Op-Codes make no sense at all - even the architect has to memorize them. for years could understand what the 1401 was being instructed to do with out constantly referring to a cheat sheet. "Was it "fun" or frustrating selecting the one character opcodes?
? for zero and add, ! for zero and subtract, Q for store A reg, lozenge for clear word mark. Where you torn on some of the assignments?" Well, there were a limited set of printable characters to choose from. I started with what I thought were the most important, most used operations and assigned the most mnemonic characters to them. After those were used up, I tried to do the best I could, but the effort proved to be too much and I had to resort to 'eeny-meenee-minee-moe'. The Op codes 1-9 makes sense to me, since 1, 2, 4 could combine for the various combinations of Read, Print and Punch. I'd be interested in hearing a better assignment of codes. With the advent of HHLs. the assignment became moot, though still useful when trouble-shooting. , is natural for word mark. lozenge, the empty box, is natural for clear word mark. A is natural for add. B is natural for branch. C is natural for compare. D is natural for move digit. E is natural for edit. F is natural for forms control. J is natural for jump (1410). L is natural for load. M is natural for move. N is natural for NOP. S is natural for subtract. T is natural for translate (1460). Z is natural for move and suppress zeroes.
? is CBA82, or +0, natural for zero and add.
! is B82, or -0, natural for zero and subtract. H for store B register? K for select stacker (and many other arcane things)? Q for store A register? V for branch if word mark or zone? W for branch bit equal? X for move and insert zeros? 8 for start read feed? 9 for start punch feed? I agree with Fran. I think I arrived at the same conclusions Fran did, concerning the obvious ones. Fran invented them, I just observed the logic behind it. I should have been less laconic about the ones for which I just wrote question marks. What I had in mind was "What else could be done?" H for store B register? - B was already taken. - S was already taken. P for move record? M was already taken. - Maybe R would have been better? Q for store A register? A was already taken. - B and Z were already taken. W for branch bit equal? B was already taken. X for move and insert zeros? Z was already taken. - Maybe I would have been better? Y for move zone? Z was already taken. - Fran has explained the logic behind this. 8 for start read feed? This is unit record I/O, too. 9 for start punch feed? This is unit record I/O, too. % for divide is obvious. @ for multiply is semi-obvious: 7 @ 9 cents each is 63 cents.
. for halt is obvious. 12 printing characters not used: G, I, O, R, U, 0 (zero), &, $, *, -, #, | (record mark). 12 nonprinting codes with 5-8, 6-8, 7-8 and either 12, 11, 0 or no zone not used. Maybe then X for branch bit equal? But this is all Monday-morning quarterbacking. Fran did a superb job. Thanks. The logic behind the choice of 1401 op codes is interesting. should be grateful for Fran's work. which would dump the rest of memory in the two line form. 360 had a bumpy start. Many felt they would rather "Fight than Switch"
(and other �computer people) said about the 1401 but they were dismissive, knew the 1401 was going nowhere and they then ignored us. That was fine with me since I did not want to waste time dealing with their views. I haven�t mentioned one other thing that shows what the Poky people thought of the Endicott lab. In about 1956 Poky leadership pursued a determined effort with headquarters to get IBM to transfer ALL electronic development from Endicott to Poky and make Endicott a mechanical design lab. Fortunately, lab director Jim Troy was a strong leader, adamantly opposed to such a move, and was able to convince the company that it was foolish. 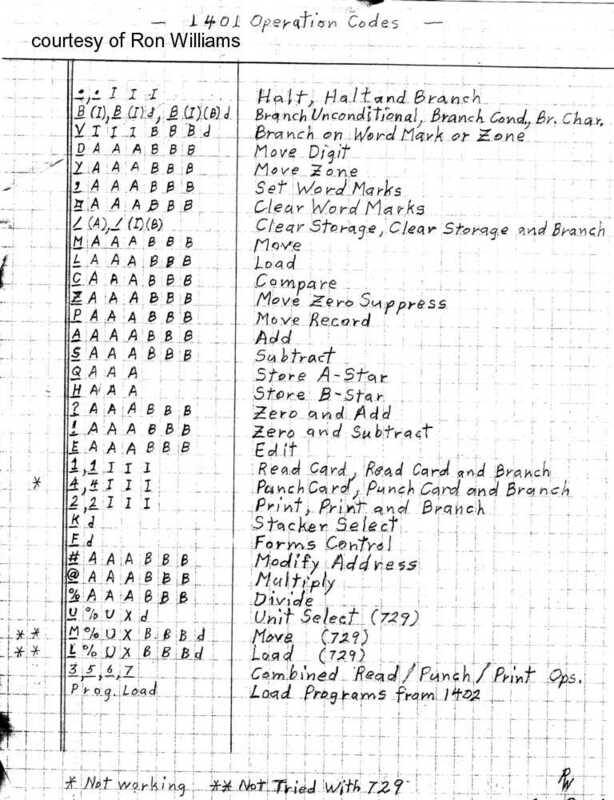 You have heard me say often that having a known �target�, the punched card installations, was extremely important to us. Fran had been immersed in punched card world for some time and I had been an operator, plugboard wirer, and manager in an installation serving the 36,000 GI�s in Korea. This background allowed Fran to really focus his architecture and allowed us to establish objectives that, if they were met, would clearly meet the customer needs in this area. The next step was Shel coming on board, doing a lot of work on skills in these installations, helping make sure the 1401 was as simple as possible and getting the required training program set for our field people as well as customer people. As you know, he also had to �train� the forecasters. I personally feel that the 1401 was easily the most �user friendly� system IBM produced until well into the 1970�s. My bias shows up when I tell you those systems were developed in the General Systems Division � the System 34 probably being the leader followed by System 38.